I'm lookin to transfer video from my two sony handycams to Roxio vhs to dvd 3. I have tried to do this thru sony transfer software with no success! I heard Roxio is easy and the answer! I would like to here from someone that has actually has the handy cams I have and has successfully done the transfer! Why you may ask, I don't have any output cables. there are 2-3 connections on each camera and don't want to buy the wrong cables. Any and all information would be great! 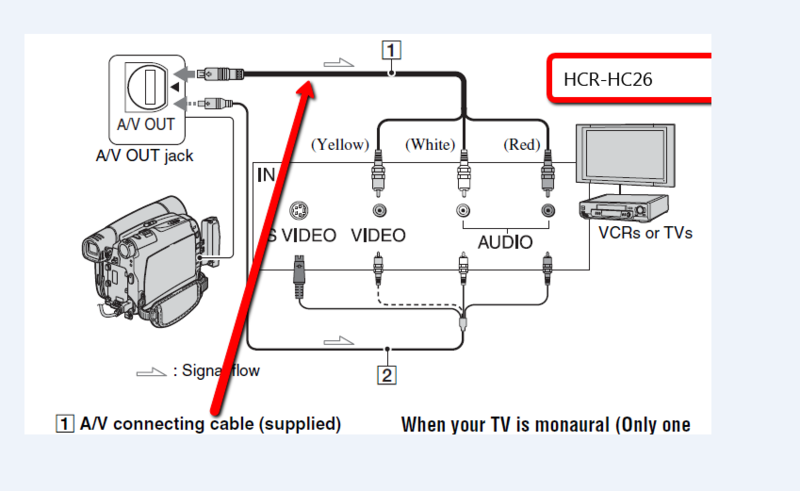 All the cables and capture device for transfer from the CCD-TRC67 analog camcorder are included with the VHS2DVD 3 package. 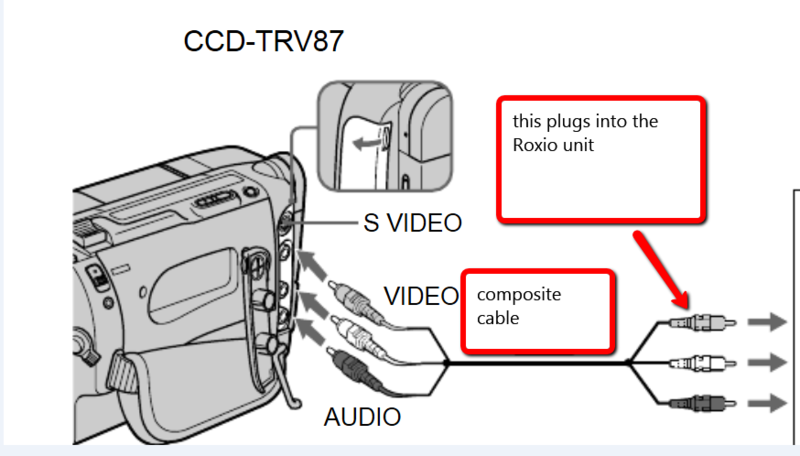 Thanks for you post, But from what I understand the Roxio device has a svideo, and the red, yellow, white RCA cables input into the Roxio device and plug into the computer thru USB. That's what I need to know, unless I'm missing something! What problems were you having with the Sony software? If you don't use that software, then you will have all kinds of problems trying to jury rig a solution. The software converts the signals directly to a signal that the computer can use. If you can't use the Sony software, you may need to use two different solutions. Does you computer have a IEEE "Firewire" connection? If that one camcorder has a disc, did you read the instructions? The disc may have to be finalized to get it to work. Yes, the 2 older camcorders use magnetic tapes and are analog, not digital. Are you saying I only need firewire cable, and there is no need for the Roxio converter and software? Have you actually converted from an analog camcorder to digital/ dvd format? from what I have tried and read its not as easy as todays devices and you just plug it in and go! 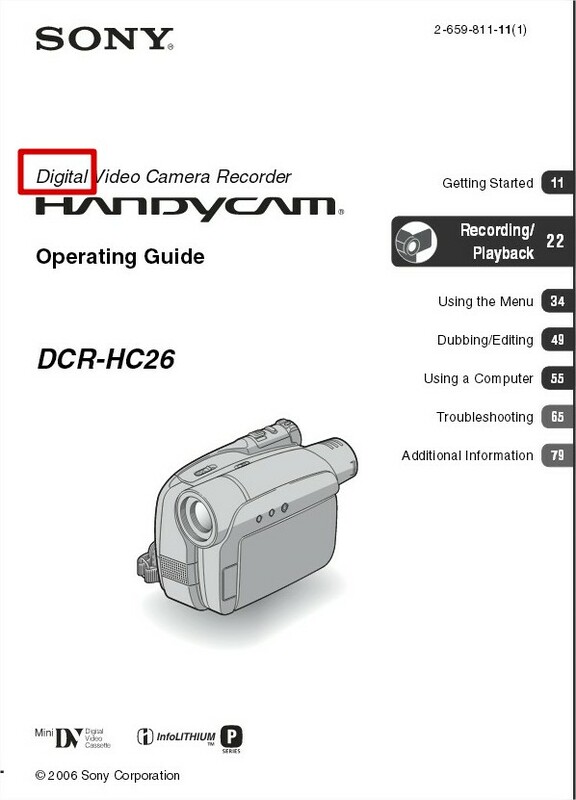 The CCD-TRV67 is an analog camcorder and the DCR-HC26 is a digital camcorder. The first requires the VHS2DVD 3 capture device which includes the required cables. The other camcorder is a digital device and requires the Firewire connection. I have recorded from both analog and digital camcorders. There is no "plug it in and go" device for these type of camcorders. You need the proper software and hardware. Walt is correct. For your digital camcorder, use a firewire connection, from the firewire port on your digital camcorder, to a firewire connection on your computer. Some computers don't have a firewire connection, but there are still add-on firewire cards available for purchase. Guys, Guys my camcorder is not digital, it uses magnetic tape! It's a DIGITAL recorder usng magnetic tape. yes, that is one of them! Both your camcorders have analog video outputs. Look at the red rectangle in the post that Brendon put up. That camcorder has an i.LINK DV Interface, which is a DIGITAL interface. That is the Sony firewire port. You need to RTFM for your camcorder. You will learn a lot. Does your computer have a firewire port on it (IEEE 1394)? I asked about firewire in post number 4 but the poster seems to ignore that request (and other suggestions). Tape does not automatically mean analog. It's magnetic media. Hard drives are also magnetic media and hold digital information. Go back (quite) a few years, and the upgrade from Audio Cassette (analog) tapes, was DAT, Digital Audio Tape. Similar format, but Digital content.